Draft: 2012, Los Angeles Dodgers, 1st rd. Corey Drew Seager…named the Gatorade 2012 Player of the Year in North Carolina and a Baseball America First- Team All-American after batting .519 with 10 homers, 37 RBI, 13 stolen bases, a .664 on-base percentage and a 1.062 slugging percentage for Northwest Cabarrus High School during his senior season…named as one of three team captains on the 2010 USA Baseball 16-and-under National Team, batting .514 with a home run and 12 RBI while earning All-Tournament honors and helping lead the team to a gold medal at the Pan-American Games in Mexico…his oldest brother, Kyle, was a third-round pick of the Seattle Mariners in 2009… middle brother, Justin, was also drafted by the Mariners, while his father, Jeff, played at Farleigh Dickinson University in New Jersey...selected by the Dodgers in the first round (18th overall) of the 2012 First-Year Player Draft and signed by Dodger scout Lon Joyce. Appeared in 26 games, slashing .267/.348/.396 with five doubles, one triple, two home runs and 13 RBI prior to missing the remainder of the season due to injury ... Had season-ending Tommy John surgery on his right elbow on May 5, performed by Dr. Neal ElAttrache in Los Angeles ... Also underwent arthroscopic surgery on his left hip on Aug. 7, performed by Dr. Bryan Kelly in New York. Posted a .295/.375/.479 slash line with 85 runs, 33 doubles and 22 home runs, while also recording career-highs in RBI (77) and walks (67) in 145 games...Ranked among the top 20 in the National League in hits (159, T-14th), multi-hit games (42, T-16th), OBP (16th), batting average (18th) and doubles (T-19th)...according to Fangraphs.com, his 5.7 WAR ranked seventh best in the NL, which was also best on the team...Recognized with his second consecutive Silver Slugger Award after leading National League shortstops in runs (4th ML), hits (T-4th ML), doubles (T-5th ML) and walks (1st ML), while ranking second in batting average, OBP and SLG and is third in RBI and home runs...His .361 (39-for-108) batting average with runners in scoring position ranked eighth in the NL, while his .329 (7 1- for-216) average with runners on base ranked 14th in the senior circuit...His .325 batting average (55-for-169) against left-handers ranked 11th best in the National League...Selected to the National League All-Star team for the second consecutive season...also finished 17th in the NL MVP voting...Posted a .301/.382/.507 slashline with 20 doubles, 12 homers and 41 RBI in 73 games at Dodger Stadium...ranked top 20 in the NL in doubles (20, T-9th), hits (82, 12th), runs (50, T-13th), SLG (19th), batting average (20th) and OPB (20th) at home...On June 20 vs. New York-NL, ripped his second-career three home run game and established a new career- best with six RBI...on June 11 vs. Cincinnati, he stroked his first career grand slam homer off of Raisel Iglesias...Went 9-for-38 (.237) with one double, one triple, one home run and six RBI in 10 Postseason games...missed the NLCS vs. Chicago due to a low back sprain. Unanimously awarded the National League's Rookie of the Year and selected as an All-Star in his first big-league season...was the Dodgers' 17th Rookie of the Year and the 21st player overall to win the award by unanimous vote...Was also a finalist and finished third in the MVP voting...recognized with a Silver Slugger Award, the Players Choice Award for Outstanding NL Rookie and by both The Sporting News (NL) and Baseball America (MLB) as the publications' Rookie of the Year...Finished the season ranked among the NL leaders in hits (193, 2nd), runs (105, 5th), doubles (40, 7th), multi-hit games (57, T-2nd), extra-base hits (71, 7th), total bases (321, 4th), batting average (.308, 7th) and slugging percentage (.512, 10th)...according to Stats, LLC, is just the fourth rookie in the divisional era (since 1969) to rank in the NL's Top 10 in batting average and slugging percentage, joining Dusty Baker (1972, ATL), Mike Piazza (1993, LA) and Albert Pujols (2001, STL).... His 26 homers established a Dodger record for a shortstop, breaking the previous record of 22, held by Glenn Wright (1930)...joined with his brother Kyle (30 HR) to become the first set of brothers with 25+ homers each in the same season...His 193 hits were the most by a big-league rookie since 2001, when Albert Pujols had 194 hits and Ichiro Suzuki knocked 242...Established Los Angeles rookie records in hits, runs and doubles, while ranking among the club rookie single-season leaders in homers (T-2nd), RBI (6th), average (2nd), on-base percentage (2nd) and slugging percentage (3rd)...Topped Major League rookies in games played, hits, runs, doubles, RBI (T-1st), multi-hit games (57) and walks (54), while ranking second with 26 homers... Batted .295 with RISP (33-for-112) and hit .333 with runners on base (85-for-255, 7th NL)...Posted a .334/.391/.557 slashline vs. right-handers, going 144-for-431 with 21 of his 26 home runs…his average vs. RHP was the fourth-best in MLB... Named to the National League All-Star team and participated in the HR Derby, becoming the youngest position player to be honored as an All-Star in franchise history at 22 years, 69 days old (previous: Pete Reiser: 22 years, 113 days) and the third-youngest Dodger All-Star overall (at the time of their first selection), behind only Fernando Valenzuela and Ralph Branca...Posted the second-longest hitting streak by a rookie in Los Angeles history with a 19-game run from June 16-July 6, behind only Tommy Davis' 20-game run from July 30-Aug. 20, 1960...batted .392 (31-for-79) with 10 doubles, two triples, two homers and five RBI...Named NL's June Rookie of the Month... On June 3 vs. Atlanta, launched three solo home runs for his first career three-homer game, becoming the first Dodger rookie to do so…he also was the first rookie shortstop in MLB history to have a three-homer game and the sixth youngest player overall to accomplish the feat...Blasted first-inning homers in Games 1 and 2 of the NLDS at Washington and went 9-for-44 (.205) with a double, two homers and four RBI in 11 postseason games. Had his contract selected by the Dodgers on Sept. 3 and batted .337 with a .425 on-base percentage, eight doubles, a triple, four homers and 17 RBI in 27 September games. ... Ranked eighth in the NL (min. 50 AB) in Sept./Oct. OPS with a .986 mark. ... Reached base safely in 24 of 25 starts…reached base safely in the first 21 starts of his career, becoming the first Los Angeles Dodger to do so…the last Dodger in franchise history to accomplish the feat was Jim Gilliam, who reached base in his first 24 starts in 1953 in Brooklyn. 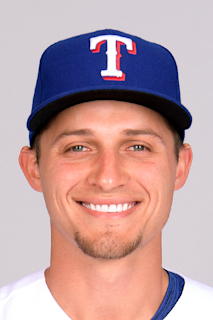 ... Made his Major League debut on Sept. 3 as the starting shortstop at San Diego, going 2-for-4 with a double and two RBI…picked up his first hit in his second at-bat with a double off Colin Rea. ... Hit his first big league home run on Sept. 12 at Arizona with a solo shot off Josh Collmenter…went 4-for-4 with three runs and three RBI in the contest. ... Reached base safely in nine consecutive plate appearances Sept. 10-11 at Arizona, becoming the first Los Angeles rookie ever to accomplish the feat (Source - Elias Sports Bureau). ... Made 21 starts at shortstop in the Majors and appeared in six games (four starts) at third base…posted a .949 fielding percentage at shortstop (five errors) and did not commit an error at third base. ... Appeared in all five of the Dodgers' NLDS games against the Mets, starting four games at shortstop, and went 3-for-16 with a double (.188). ... Combined to hit .293 with 37 doubles, 18 home runs and 76 RBI in 125 minor league games with Double-A Tulsa and Triple-A Oklahoma City, earning a selection to Baseball America's 2015 Minor League All-Star Team and as the publication's Triple-A Player of the Year…combined to appear in 104 games at shortstop and 19 games at third base in the minors Opened the season at Double-A Tulsa, where he batted .375 with seven doubles, five home runs and 15 RBI in 20 games to earn a May 1 promotion to Oklahoma City…was named a midseason Pacific Coast League All-Star, batting .278 with 30 doubles, 13 home runs and 61 RBI in 105 games with OKC. ... Appeared at his first big league Spring Training as a non-roster invitee…entered the season rated as the Dodgers' No. 1 prospect and as the seventh-best overall prospect by MLB.com. Named the Dodgers' Branch Rickey Minor League Co-Player of the Year, played for the U.S. team at the XM All-Star Futures Game, and named to Baseball America's Minor League All-Star Team, combining to hit .349 with 20 homers and 97 RBI in 118 games with Single-A Rancho Cucamonga and Double-A Chattanooga...named Baseball America's Single-A Classification Player of the Year... posted a .402 combined on-base percentage and a .602 slugging percentage. ... Selected 2014 California League's Most Valuable Player after leading the league in doubles (34), total bases (207), extra-base hits (54), slugging percentage (.633) and OPS (1.044) at the time of his promotion (July 17)..also selected as a California League mid-season and post-season All-Star. ... Also ranked among California league leaders in hits (115, T-3rd), batting average (.352, 2nd), home runs (18, T-5th) and RBI (70, T-6th) at the time of his promotion. ... Was promoted to Double-A Chattanooga on July 17, where he helped lead the Lookouts to a postseason berth by hitting .345 (51-for- 148) with 16 doubles, three triples, two home runs and 27 RBI in 38 games. ... Earned California League Player of the Week honors, May 19-25. ... Entered 2014 rated by Baseball America as the Dodgers' No. 2 prospect. ... Played in the Arizona Fall League for the Glendale Desert Dogs, earning a selection to the league's All-Prospect Team and starting at shortstop in the league's Rising Stars Game. Combined to hit .269 with 16 home runs and 72 RBI in 101 games with Single-A Great Lakes and Rancho Cucamonga in his first full professional season. ... Opened the season with Great Lakes, where he posted a .309/.389/.529 slashline, going 84-for-272 with 12 homers and 57 RBI in 74 RBI. ... Promoted on Rancho Cucamonga on Aug. 3 and hit .160 with four home runs and 15 RBI in 27 games as one of the youngest players in the California League. ... Following the season, played for the Glendale Desert Dogs of the Arizona Fall League, batting .181 with three doubles, two homers and 10 RBI in 19 games…selected to the league's Rising Starts Game. Appeared in 46 games with Rookie-level Ogden in his first professional season after signing with Los Angeles on June 30…hit .309 with a .383 on-base percentage, nine doubles, eight homers and 33 RBI. November 2, 2018 Los Angeles Dodgers activated SS Corey Seager from the 60-day injured list. May 12, 2018 Los Angeles Dodgers transferred SS Corey Seager from the 10-day disabled list to the 60-day disabled list. Right UCL surgery. April 30, 2018 Los Angeles Dodgers placed SS Corey Seager on the 10-day disabled list. Right UCL sprain. October 24, 2017 Los Angeles Dodgers activated SS Corey Seager. October 14, 2017 Los Angeles Dodgers reassigned SS Corey Seager to the minor leagues. September 3, 2015 Los Angeles Dodgers selected the contract of SS Corey Seager from Oklahoma City Dodgers. May 1, 2015 SS Corey Seager assigned to Oklahoma City Dodgers from Tulsa Drillers. January 9, 2015 Los Angeles Dodgers invited non-roster SS Corey Seager to spring training. July 18, 2014 Corey Seager assigned to Chattanooga Lookouts from Rancho Cucamonga Quakes. July 12, 2014 Rancho Cucamonga Quakes placed SS Corey Seager on the temporarily inactive list. May 3, 2014 Rancho Cucamonga Quakes activated SS Corey Seager from the 7-day disabled list. March 9, 2014 SS Corey Seager assigned to Los Angeles Dodgers. August 2, 2013 SS Corey Seager assigned to Rancho Cucamonga Quakes from Great Lakes Loons. June 2, 2013 Corey Seager roster status changed by Great Lakes Loons. May 10, 2013 Great Lakes Loons placed SS Corey Seager on the 7-day disabled list. March 31, 2013 SS Corey Seager assigned to Great Lakes Loons from Rancho Cucamonga Quakes. March 28, 2013 Corey Seager assigned to Rancho Cucamonga Quakes from Ogden Raptors. March 6, 2013 SS Corey Seager assigned to Los Angeles Dodgers. July 4, 2012 Corey Seager assigned to Ogden Raptors. June 30, 2012 Los Angeles Dodgers signed SS Corey Seager.